Free Shipping Included! SLIK Sprint Pro II 4-Section Tripod with 3-Way Panhead, Black (611-863) by Slik at Nebula Fia. MPN: 611-863. Hurry! Limited time offer. Offer valid only while supplies last. The second generation of the popular SLIK SPRINT PRO the SPRINT PRO II 3-WAY BK (Black finish) has padded leg wraps for more comfortable carrying. The second generation of the popular SLIK SPRINT PRO the SPRINT PRO II 3-WAY BK (Black finish) has padded leg wraps for more comfortable carrying. 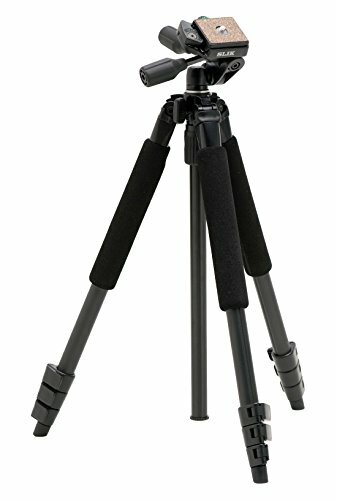 This full sized tripod (when fully extended has a 3-way panhead (SH-704E) with quick release shoe for easy mounting and removal of camera. The tripod is an excellent travel partner for a light-weight mirrorless interchangeable lens camera (ILC) system or light weight DSLR. With a capacity of 4.5 lbs. the tripod can handle up to a midrange DSLR with a standard or kit lens. The SPRINT PRO II 3-WAY is a full sized tripod when it is extended to its maximum height of almost 64 inches. The adjustable legs angles can be used to splay the legs out and lower the tripod. When used with the built-in short center column, (the included center column unscrews into two pieces) the camera is just 6.4 inches off the ground for extremely low angle or macro photography out in the field. Another way to get the camera low is to reverse the center column which could be used for macro photography or copy work. If you have any questions about this product by Slik, contact us by completing and submitting the form below. If you are looking for a specif part number, please include it with your message.